Were you looking for the Nightfall armor, a superficially similar combat suit used by ONI operatives or the black body suit, a vacuum-enabled suit of light armor? The ODST battle dress uniform (BDU) is a suit of combat armor worn by the Orbital Drop Shock Troopers, special operators of the UNSC Marine Corps. With multiple models having seen production, the suit can be configured for a variety of combat roles and can even be used in conjunction with MJOLNIR powered armor. The ODST body armor is a signature piece of equipment used by the Orbital Drop Shock Troopers. The suit, which is produced by Misriah Armory, is vacuum-rated and is capable of extra-vehicular activity for fifteen minutes. The armor provides numerous advantages in the field, including ballistic protection, temperature control, as well as thermal insulation against extreme temperatures experienced during atmospheric entry and thermal protection from Covenant energy weapons. The ODST armor has gone through several design changes since the start of the Human-Covenant War. The current version incorporates technology initially developed for the MJOLNIR Powered Assault Armor, most notably the helmet. This also includes ceramic-titanium composites for armor plating to give the user added protection. It features a heads up display and communications systems, notably the Visual Intelligence System, Reconnaissance, to give more situational awareness to the wearer. The ODST BDU has been in use since the Insurrection, if not earlier, and remains unmatched in its ability to protect its wearer over other BDUs during the toughest operations. The BDU excels at providing more protection against small arms fire than other infantry body armor, and also excels at allowing a trooper to conduct Military Operations in Urban Terrain (MOUT) without little chance of being detected in dark locations. The BDU's stealth capability is partly thanks to its black and gray camouflage patterns on the legs, boots, gloves, chest, helmet and undersuit - these urban camouflage patterns are optional; without the camouflage panels, the BDU is black. On the left shoulder pad of every ODST is a UNSC MED REF patch. This patch contains basic medical information about the trooper, and allows a certified medic to gain a quick medical reference to an ODST wounded in the field. 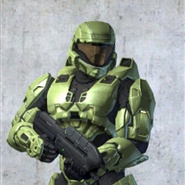 Despite the armor's obvious advantage over standard infantry armor, it is still vulnerable to Covenant energy weapons, armor-piercing rounds, and large explosive devices. By 2558, some of the adaptive design features of the SOLDIER-class Mjolnir system were integrated to some newer models of ODST armor. While the standard ODST BDU is fully capable for any role, there are specialized variants of the BDU - these suits are specifically issued to a specialist of a certain field to provide them certain advantages during an operation. As such, specialized gear is only available by Mission Conditional Requisition (MCR). Depending on mission requirements, an ODST operative may request either additional, or variant equipment that ranges from helmet attachments, gloves, battery, equipment or communication rucksack. An up-armored variant of the ODST BDU, the ODST/UA PPE is issued to personnel whose specialization requires extra armor, such as demolition experts. This version of the battle armor is specifically designed to aid an ODST in CQB-type combat conditions. The standard left pauldron is replaced with a longer two-piece ballistic plate, which aids in protecting the trooper's upper body while in a firing stance, and also to reduce severe injury from plasma-based weaponry. The helmet is also issued with an optics device that aids the user in relaying images and video to teammates or command. The sharpshooter BDU is issued to sniper experts in the field. This BDU is designed to give an ODST sharpshooter more freedom in combat - the standard right pauldron is removed, allowing the sniper to aim better and move his arm more freely with a sniper rifle, while the standard left pauldron is replaced with a larger plate to protect the sniper's arm from counterattacks. The sharpshooter variant is also issued with an O/I (ocular/integration) optics device attached to the helmet, while the Oracle scope on the SRS99 can be smart-linked to the user's HUD. The UA/Bullfrog BDU is a BDU used relating to the specializing in the use of portable jump-jets. The S-1 reconnaissance PPE/BDU is a specialized Office of Naval Intelligence variant of the ODST armor. The armor is only issued to ONI reconnaissance agents for high risk operations. The undersuit of the armor, which is superficially similar to the standard ODST armor, is designated as the S1/ONI field fatigues. However, the chest plate is replaced with a specialized one, to provide stealth capabilities with little or no loss of endurance, specifically by reducing its IR signature and reflective surfaces. The torso part of the armor also varies from the standard version, having a green, translucent orb in the center. There are no shoulder pauldrons issued with this variant, which allows more freedom of arm movement. This variant also uses a version of the Recon helmet. The helmet, chest, and shoulders of the ODST armor are compatible with and available for the Mark V platform. The chest on this variant is part of the up-armored set of Mark V upgrades. The ODST helmet is available for the Mark VI platform. After the instatement of the Spartan branch, numerous Orbital Drop Shock Troopers were recruited into the SPARTAN-IV program. Almost inevitably, the first-generation MJOLNIR/ODST variant was updated for compatibility with MJOLNIR (GEN2). Despite considerable differences from the standard version of the armor, the system contains many features expected of Special Forces gear, making it desirable for use by former ODSTs. It was manufactured by Cascade Stronghold Technologies and tested at Mindoro, Lhopat on Cascade. The GEN2/ODST variant shares several design elements with its predecessor, though it also sports several changes. It still uses the standard helmet and shoulder pauldrons; it also features upgraded versions of the Mark 117 chestplate and the M/LBE Hard Case. However, the chestplate covers more of the torso below the thoracic cavity. The rest of the armor, including the greaves and cuisses, gauntlets, and boots, is more closely derived from the regular MJOLNIR (GEN2) milieu. Manufactured by Cascade Stronghold Technologies under a research partnership with the UNSC and Cascade, the Helljumper variant is another instance of adapting the ODST armor to the MJOLNIR GEN2 platform. A handful of prototypes had entered service with the UNSC as of 2558. It is the most heavily armored and bulkiest incarnation so far, with mostly smooth curved surfaces and many components bolted on. The Nightfall armor is a specialized variant meant for hostile environments. Like the standard ODST BDU, it retains fall impact negation and a built-in VISR suite but also introduces best-in-class life support and a camera within the helmet's brim. The life support consists of an oxygen tank located in the chest armor. The MJOLNIR [GEN2] adaption adds a data crystal chip port, putting it inline with other MJOLNIR variants. It doesn't include the armored backpack like the standard MJOLNIR/ODST variant, but does feature storage pouches across the front of the lower torso. A study of the ODST armor in Halo 3. The ODST battle dress uniform is comprised of several different components and layers that make the suit what it is, while technology from other projects across the military have been incorporated into the suit, ODST equipment still has proprietary technology that has not been adopted into other equipment for the military. The ODST helmet is seemingly derived from the standard-issue CH252 helmet. The modern version of the helmet was adapted for use with MJOLNIR; the technological advancements made, such as CTCs, were incorporated back into the ODST helmet's regular production. It is made of titanium and is coated with a heat-resistant material to help disperse heat - the inside is lined with black padding to provide comfort when the user is wearing it. The helmet's faceplate is made of a strong, glass-like material with the ability to polarize. When polarized, the helmet's faceplate has a bluish silver color and obscures the wearer's face completely. However, the ODST helmets worn by the Spartan-IIs during their training had a golden-orange polarization, and Michaels wore a red-polarized helmet during the Battle of Ariel. There is also an up-armored variant of the standard helmet designed for close-quarters combat, designated the ODST-HS Combat Helmet. The helmet provides excellent protection against small-arms fire and small explosive attacks. The helmet is also essential in providing an ODST the ability to perform EVA and also provides a heads-up display (HUD), giving the wearer basic information including a targeting reticule, weapon information, ammo capacity, and basic health readout. The newest version of the helmet integrates with the user's standard neural interface to provide more tactical data to the HUD. Helmet-integrated neural interfaces is another piece of technology that has seen widespread adoption from Project MJOLNIR. Along with this state-of-the-art equipment, the helmet is also equipped with its own thermal imaging and motion sensors. There are also several external optical modules that can be attached to the helmet, including the ODST-CNM used by some squad leaders or an optical/integration module which enhances smart-linking capabilities and communication systems. Another version of the helmet is very similar in design, though its faceplate is noticeably less convex and is colored a deep shade of blue. This model bears less resemblance to the CH252 combat helmet, most notably in the backward-swept over the ears and jaw. Due to its cross-platform nature, the ODST helmet may also be worn with other armor systems. Spartan-IIs wore ODST helmets in conjunction with their body suits during their training and on their first combat mission. 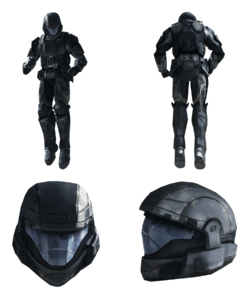 In 2535, the MJOLNIR Powered Assault Armor/AA variant, which was developed as an improvement of the ODST helmet, was introduced as the UNSC Army airborne's standard-issue helmet. The ODST BIOS is firmware, designed to be the first code run by the ODST armor when activated. The initial function of the BIOS is to identify, test, and initialize system devices such as the heads-up display, VISR and other hardware. The BIOS handles most of the armors software functions when initiated. Updates to the BIOS allow newer hardware to be supported and function. BIOS versions can be viewed though the ODST armors magnification system when no weapon is being held or no zoom-supported weapon is being held. VISR greatly broadens the range of information available to the individual combatant. The Visual Intelligence System, Reconnaissance (VISR) is issued with the ODST helmet. The VISR proprietary data management suite enables a user to link into UEG, CAA, and UNSC infrastructure systems at the local, national, and global levels - however actual access level is administered on a need/rating basis. This allows the user to store and review mission content up to 610MB combined, the system also provides street level navigational data, and receive secure real-time mission data. In addition, every current issue helmet ODST BIOS A29.817941B.01 or later is equipped with low-light vision enhancement, which outlines hostile units in red, friendlies in green, weapons in blue, and objects of interest in yellow. The ODST body suit is composed of several different layers and materials. The inner layer of the black-gray undersuit is made of Kevlar to aid in protecting the wearer from small arms fire. The inner layer contains a heating and cooling system which regulates temperatures to keep the user warm or cool depending on the weather conditions - the heating and cooling system can also match infrared signatures of the current weather as well to allow an ODST to go undetected in hostile locations. The outer layer of the undersuit is coated with a heat-resistant material to aid in reducing temperatures experienced during orbital drop, and against Covenant plasma weapons. The body suit also doubles as a pressure suit to allow an ODST to perform extra-vehicular activity. As with the helmet, the Mark 117 chest plate is composed of titanium and ceramic materials. It covers the chest from the bottom of the clavicle to the bottom of the rib cage, with another segment protecting the abdomen. Some body suits feature an armored collar that protects the wearer's neck, complementing the chest plate's coverage. A pair of wide, low-profile shoulder pauldrons are featured, though some ODSTs, such as snipers or CQB specialists, may opt for an alternate model or none at all. The shin and knees are well protected with titanium-ceramic guards, as are the forearms. A different armor set features a much slimmer chestplate; a shorter collar; and smaller, lower-profile pauldrons. This version offers no protection to the groin. The greaves are nearly identical to those worn with the standard set. Designated as the M/LBE Hard Case, the rucksack issued to ODSTs is, for all intents and purposes, an armored backpack that attaches to the back of the armored vest. The rucksack comes in a number of different variants. The main purpose is storage, which allows a trooper to store equipment, ranging from ammunition, to medical supplies, to explosives, to battery packs which provides power to any equipment an ODST may carry, and communications, which houses the necessary radio and satellite gear that an ODST squad requires to report in to their superiors. For longer missions, ODSTs can carry larger rucksacks with enough supplies for two weeks of operation without external resupply. Rucksacks have integrated magnetic holding devices to allow for external back mounting of additional equipment. Equipment with magnetic properties, such as longer weaponry, can be carried externally over the rucksack eliminating the use of extra straps or slings. Because the rucksack's casing is armored, it gives the ODST wearing it an additional layer of protection from behind. The MJOLNIR Mark VI with the ODST helmet in Halo 3. The ODST helmet is available as an armor permutation in Halo 3 multiplayer. The Spartan version of the helmet differs from the standard version in the polarization color of its visor; regular ODST helmets have bluish-silver polarization, while the MJOLNIR ODST helmet retains the gold electroplating possessed by most MJOLNIR armor. It is unlocked by earning the Spartan Graduate achievement, or by earning 5 XP in Matchmaking. Description: Many technologies initially developed for Project: MJOLNIR have gained widespread adoption; the use of CTCs for body armor and helmet-integrated neural interfaces being the most visible. In Halo: Reach, two upgrades are available for the helmet. The first, (UA/CNM), adds an up-armor plate with a Command Network Module on the left side, and the second, (CBRN/HUL), adds a Chemical, Biological, Radiological, and Nuclear Module with a Hardened Uplink Module on the right side. The shoulder pauldrons, breastplate, and helmet of the ODST armor are also available for purchase in the Armory. Unlike in Halo 3, the ODST armor can be used in all game modes. The ODST helmet is one of the most recognizable faces of the UNSC's Special Forces. Description: Many technologies initially developed for MJOLNIR have gained widespread adoption. Description: Up-armored variant with Command network module. Description: For operations in hazard zones; hardened uplink module. Description: Many technologies initially developed for MJOLNIR have seen widespread adoption. Unlock: Purchase the Infinity Armor Pack. This is not usable in Spartan Ops. Description: Quite possibly one of the most thoroughly tested armor systems across the entire UNSC. The ODST armor resembles the first concept art of what would become the Mark V Mjolnir armor. This design by Shi Kai Wang was scrapped because, according to the artist, it made the Master Chief look "too mean." The visor's ability to polarize, the VISR mode, and the HUD it displays may mean that the helmet has a transparent Organic Light Emitting Diode (OLED) coated screen. The Good Samaritan achievement unlocks the ODST armor for the player's Xbox Live avatar if the user has Halo Waypoint. The helmet cannot be removed, rendering any avatars wearing it completely anonymous. The armor worn by the squad in Halo 3: ODST have exactly the same scratches and burns, due to the reuse of the same basic in-game model for each character. On the cover of Ultimate Comics: The Ultimates Volume 1 #4, General Nick Fury and several S.H.I.E.L.D. agents are depicted wearing armor clearly inspired by that of the ODST. The ODST BDU in Halo 2. An ODST wielding a BR55 Battle Rifle on Installation 05. A squad of ODSTs aboard a D77-TC Pelican. A render of an ODST for Halo 2: Anniversary. A back view of an ODST for Halo 2: Anniversary. ODSTs seen wearing their armor on Installation 00 in Halo 3. Various concepts of different ODST armor variants. The VISR system integrated to the ODST helmet. The HUD magnification system of the ODST helmet. The Rookie, clad in default ODST armor. The armor permutations worn by Alpha Nine. Concept art of the ODST helmet for Halo: Reach. An ODST saluting in Halo: Reach. An ODST helmet on a suit of MJOLNIR Mark V armor in Halo Reach. The MJOLNIR Mark V ODST helmet with the UA/CNM attachment in Halo: Reach. A member of the Bullfrogs in full combat dress. An ODST aiming an MA37 assault rifle in Halo: Reach. Concept art of Halo 4's GEN2 ODST armor. The MJOLNIR GEN2 ODST armor in Halo 4. Full body shot in Halo 4. An ODST armor-clad Spartan on Landfall. T. Rymann and S. Hartley in their battle armor during the Battle of Sector Six. Private S. Hartley during the Battle of Sector Six. An Xbox LIVE avatar award unlocked via Waypoint and an achievement. An ODST clad in Halo 2-style armor in Halo: Escalation. ODSTs clad in armor in Hunt the Truth. Concept art of ODST armors for Halo 5: Guardians. Atriox, leader of The Banished, wears ODST chest armor to protect his abdomen in Know Your Enemy. An ODST in Halo Wars 2. Sunray 1-1 wearing variations on the standard ODST kit, including both Halo 2-style and Halo 3-style helmets. A variety of ODST armor designs worn by Fireteam Raven in Halo: Fireteam Raven. Antonia Silva wearing Halo 2-style ODST armor in Halo: Fireteam Raven. ↑ 4.0 4.1 Halo: Reach: ODST helmet Armory description: "Many technologies initially developed for MJOLNIR have gained widespread adoption." ↑ Halo: Reach, Armory, MJOLNIR AA variant description: "The MJOLNIR/AA variant was developed as an improvement of the venerable ODST helmet."